Two new Toronto-area businesses are reaching out to video creators around the world and promising ways to make money, but are taking two different approaches. Rumble.com pays video creators to upload their video to a Youtube-style network and distributes it across various channels with major brand partners. Notch Video invites video creators to create a profile to be found by marketers looking to make an online video looking to offer them work. Today we look at how two well-known video creators react to Rumble.com. Youtube is a bad deal for video creators, says Chris Pavlovski, CEO and founder of Rumble.com, a Toronto-based video site that’s trying to create a better alternative. Youtube could be great exposure for video talent, Pavlovski grants, but a success of receiving even 1 million views might lead to being paid only $200. That same result would pocket you $2,000 on Rumble.com, he says. While 33 per cent of all online video views are on Youtube, that leaves 67 per cent of the market to access outside of Google’s user-generated content giant. Rumble is tapping into that by partnering with major web brands including Bell Media, Yahoo, Sun Media, Shaw Media, Post Media, and more. A Microsoft deal will see Rumble’s video distributed on Xbox Live, MSN web sites, and via a Windows 8 app. Video creators looking to make money are discouraged by Rumble from uploading their content to Youtube. Three money-making options are presented to uploaders and two of them require exclusive licencing to Rumble. A non-exclusive licence is available, but reduces the amount of money that can be made on the video. Two exclusive licencing options allow the uploader to be paid upfront for their content, and a third option offers a profit sharing plan that yields payment when a video is selected for wider distribution. Operating since October 2013, Rumble has received more than 10,000 video uploads and traffic is growing. The site saw almost 234,000 visitors in November and expect about 682,000 in January. But can Rumble.com really play David to Youtube’s Goliath? Youtube pulls in more than 1 billion visitors per month, and 100 hours of video are uploaded every minute, according to Google. The partner program created in 2007 features more than 1 million video creators earning revenue, and thousands of channels earn a six figure income. So does Rumble pose a fighting chance? Not likely, says Kevin Nalty, a Youtube star best known as his username “Nalts.” His comedy videos have nabbed more than 225 million views on Youtube and he’s one of the most subscribed-to channels. When he learned about Rumble.com from an inquiry made by ITBusiness.ca for comment, he had such a strong reaction that he was motivated to write a blog predicting the death of Rumble. Youtube also offers monthly payout and clear daily metrics so content creators know what they’re going to make, Nalty adds. Rumble can take up to three or four months to pay creators who choose the profit sharing option, but pay those who choose the cash option up front. Plus, it’s just too hard to move an audience from Youtube, Nalty says. So video makers currently operating channels there aren’t likely to move to Rumble. Another, Canadian, video creator has a more optimistic view of Rumble’s chances. Mark McKay is the director of digital communications at the University of Waterloo and in the past has produced branded video content for Molson and other clients. He also worked as creative director on Ford Canada’s social media team, partnering with Youtube creator Patrick Boivin to create a zombie-themed video to market the launch of the 2013 Ford Escape. 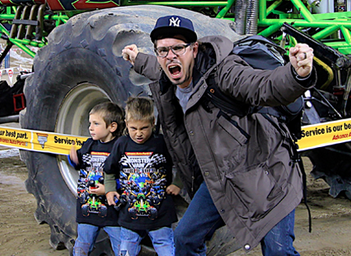 Video creator Mark McKay appears to enjoy being a Dad just as much as he does making content. Videos picked for wider distribution on Rumble’s network are in part determined by a quality algorithm, Pavlovski says. It takes into consideration more than 200 variables such as the number of views and shares a video receives, how often people are rewinding the video to watch sections over again, how the video is tagged, and the authority of the viewer watching it and engaging with it. The algorithm is always being fine tuned. “It’s almost like Google’s Page Rank but this is for video vitality and quality,” he says. Rumble will also have the benefit of the experience offered by new board members Kan Singh, co-founder of Plurk.com, and Josh Abramson, the founder of CollegeHumor and Vimeo, and a friend of Pavlovski’s since 2005. Pavlovski will also bring the tools he’s developed at past video-oriented startup, Jolted Media Group. That firm operated viral video site Jokeroo.com, also distributed via Microsoft channels, and developed a proprietary video advertising featured called Video Fade. Video Fade, which shows advertising on a screen surrounding a video instead of interrupting its playback, could make its debut on Rumble in about three months time, Pavlovski says. It could be another way for video creators to monetize their content. For now, Pavlovski wants to recruit more video creators to get content on the site. It’ll be up to those video creators if Rumble.com presents a good deal or not.